Hello beautiful nail peeps! 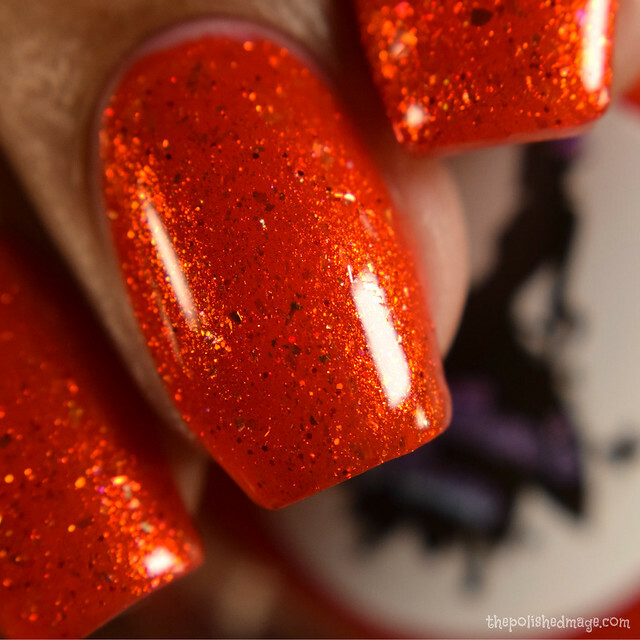 Today I have a review of the Hue and Q fall collaboration set, from the talented makers of Heather’s Hues and Quixotic polish. I keep seeing people in the community asking for fall palettes, so those of you asking here is your answer! The collaboration collection consists of 6 shades inspired by crunchy leaves, hoodies and dusky weather. Each maker has created three polishes! Let’s start with the Heather’s Hues contributions first. 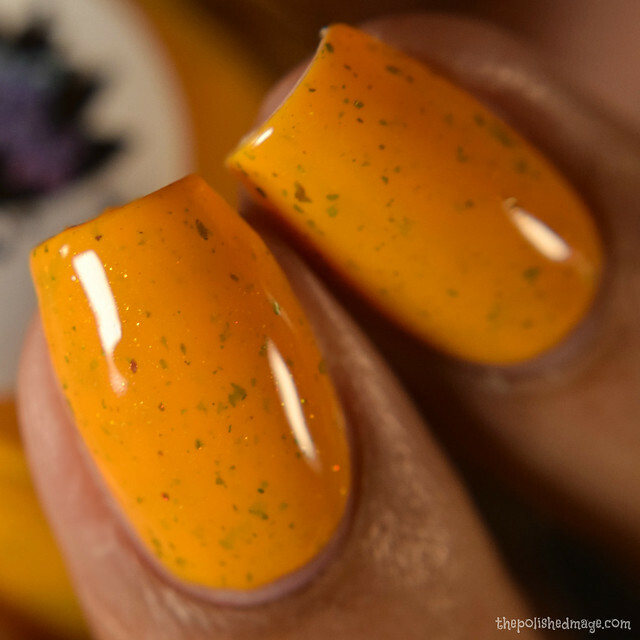 Sunflower Season: a gorgeous mustard yellow crelly sprinkled with peach and canary microflakes, and gold/bronze/silver, red/orange/copper, and green/copper/gold multichrome flakes. Swatches show two buttery coats with topcoat. This has a rich, easy to use formula that applied very opaque and I can’t see many people needing a third coat. The base color is a perfect mustard that I think will flatter most. As a gold toned person, this didn’t wash me out and I really liked how it looked on me. There is a scattered sparkle from the microflakes and the larger flakes give a shifty scattered appearance. No texture after topcoat. Swatches show two coats with glossy topcoat. This has that lovely opaque formula to it, that I think most will get full opacity at three thin or two normal coats. There is a scattered sparkle all over and the flakes contrast perfectly against the base in teals, blues and greens. No texture after topcoat. Septem-berries: a unique red jelly filled with red-gold-green aurora pigment, gold holo dust, red-gold holo microglitters, and iridescent flakes in red/pink/gold/green. Swatches show three thin coats with glossy topcoat. 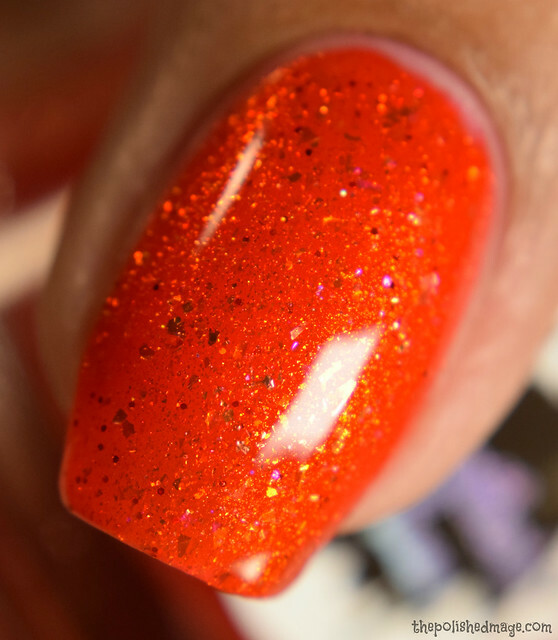 My swatch video shows the super ease of opacity in this one. 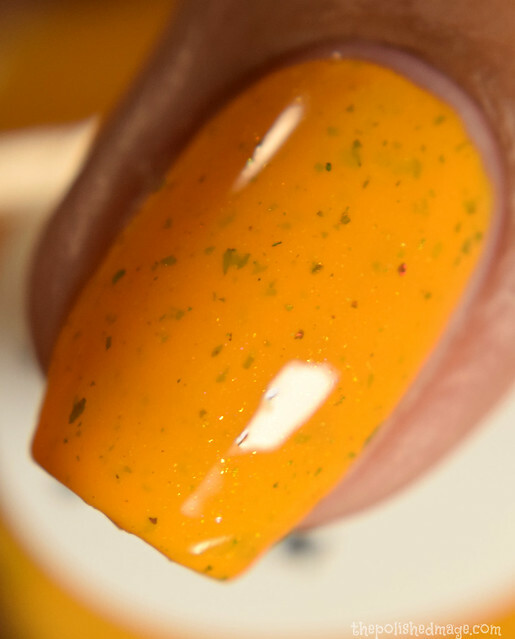 For a jelly, it has a rich application and I think most will be happy with two coats. Three thin coats fully covered any VNL for me and the inner glow is so strong. It has a bright gold shift to it, and smolders like embers. Very bright, but so, so fall. Now for the Quixotic portion of the set! 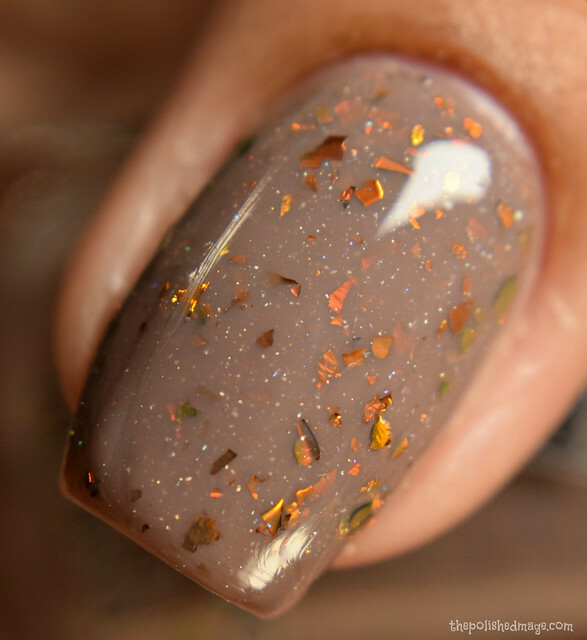 Let me fall: A chinchilla grey base with delicate holo sparks and shining red/orange/gold Ucc flakies. Swatches show three coats with topcoat. The formula has a light feeling to it, but builds easily and at three coats I had no VNL showing. The base is a taupe like neutral to me that contrasts strongly against the flakes. Speaking of those, they steal the show and easily shift from reds, oranges, golds and greens on your nail. There is a background of scattered sparkle. No texture after topcoat. I love you, olive juice: A sultry, dark olive green with a hint of gold shimmer, linear holographic effect and delicate holo sparks. Swatches show two coats with topcoat. This one dries down very glossy so I think any topcoat will do. The base is a perfect olive green, and so loaded with shimmers that I think my camera was royally freaking out. My photos are looking a little bronzey in color so I implore you to check out my swatch video to see a better color representation. Formula is buttery smooth and so very holo with a strong rainbow. Dusk your shoulders off: A dusky pigeon blue-grey with hints of holo sparks and a soft red to green shimmer. Swatches show two coats with topcoat. Since we’ve moved, my light setup is all new and I haven’t found my super shifty sweet spot for displaying color shifts in shimmers just yet so you’ll have to trust me that the shimmer in this one is very strong and easily shifts to green in person. Formula is super smooth and dries down a little on the satin side, so I’d recommend a glossy topcoat to bring out all those shimmers and sparkles. The holo is strong, but scattered and compliments the shimmer. No texture after topcoat. These go live for pre-order TODAY (9/1) at 1 EST from both maker’s shops. I love this set so much, it’s a wonderful tribute to the season we all love! Don’t forget to check out my swatch video to see these beauties in action! Your swatches are so beautiful! As a polish hound, I am so grateful people like you take the time, trouble and expense of sharing how these polishes look. There are so many indie polish makers nowadays but I wonder how they would be doing if not for nail bloggers. Those last two Quixotic polishes are calling to me!